Handwritten paper delivery tickets often had incomplete and missing data, had to be physically handed in and required hours of manual review each day. Record keeping was inefficient and paperwork was piling up as the business grew. Use GoFormz to replace paper carbon tickets with forms that drivers fill out on mobile devices. Integration with Dropbox account for automated and organized form and document storage. Conditional logic, automatic calculations and automated record keeping results in more complete data, immediate form submissions and streamlined Cloud storage and record keeping. 50-75 hours per month in administrative time is saved, and costs are greatly reduced. Based in Atlanta, Georgia, SiteMix is a concrete producer. 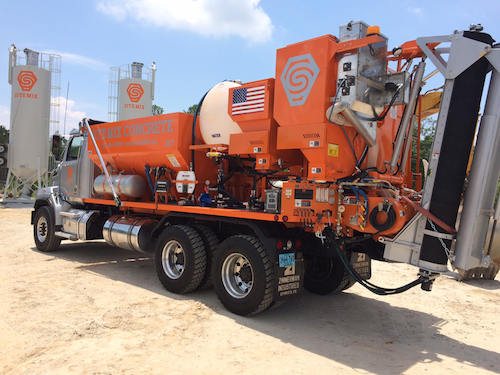 With rapidly growing residential, commercial and industrial services, SiteMix’s innovative "Concrete Plant On Wheels" trucks produce concrete directly on jobsites. In late 2015, SiteMix was delivering concrete and materials to dozens of locations every day. Drivers would fill out carbon paper tickets to track each service job and delivery. At the end of the day, Dale Henderson, SiteMix’s Operating Partner, would collect all the handwritten tickets and tally the billing and inventory numbers. As SiteMix’s business grew, this process was proving to be a challenge in terms of the daily administrative time it required, the potential for manual errors, and organizing and maintaining the record keeping. Processing the tickets every day was very time-consuming. Dale had to constantly coordinate where and when he could meet with his employees at the end of each day so that they could physically hand in their daily tickets - this was costly both in terms of time and money (fuel, labor time, etc.). Plus, it was not easy to tell if there were any missing or voided tickets in the piles of tickets that were handed in. Dale had to not only review each handwritten ticket to spot incomplete information, but he also had to make sure that the math and totals were correct. As Sitemix’s operations grew, so did the volume of tickets that Dale had to file away. He would ‘file’ the carbon copies of each ticket in monthly bundles using binder clips, and carry around the most recent months’ bundles so that he could access the records when needed. With a rapidly growing business, Dale sought to modernize the paper-based process with a technology solution that would scale. Many of the solutions that Dale initially reviewed were too expensive ($10,000+), too complex to setup, or both. He eventually found GoFormz in the Apple App Store. It was affordable and easy to use. He very quickly transformed his paper delivery tickets into forms that his drivers could fill out on tablets and phones at delivery sites. With automatic calculations that tally correct totals for billing and time values, the GoFormz solution made SiteMix’s delivery tickets more accurate and faster to fill out. Conditional logic enforces that information is always complete, and basic rules like “All Caps” ensures tickets automatically follow industry-standard formatting. GoFormz has greatly freed up Dale’s time. He no longer has to spend hours every day gathering and reviewing tickets. His record keeping has also greatly improved. Tickets are automatically submitted to SiteMix’s GoFormz account as soon as they are filled out, which eliminates the need for drivers to physically hand them in to Dale. This saves both time and costs while also accelerating processing times. Dale setup GoFormz to sync the new digital tickets to his Dropbox account, which streamlines and automates his record keeping. If he needs to find a specific copy of a ticket, Dale can instantly find it with an easy search online. Starting with the delivery tickets, Dale now uses GoFormz for many of SiteMix’s documents and forms including fueling tickets, vehicle condition reports, expense forms and inventory forms.